These one-step gloss decorating glazes are a great value - and they bring a palette of bold, vibrant colors into the classroom. Ideal for glaze layering and design, Amaco Teacher's Palette Glazes are lead-free, easy to apply, and they mix well. 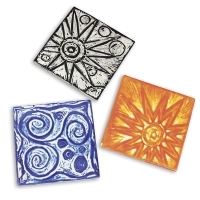 ® Amaco is a registered trademark of American Art Clay Company.® Teacher's Palette is a registered trademark.